At this event we are paying tribute to the legendary actress Sridevi. She might not be there with us anymore but she will live in our memories forever. Come let’s celebrate her life! Let’s sing and dance to the legend. Premier Tickets is an online event marketing and ticketing agency. Premier Tickets will NOT be responsible for any changes related to the event schedule, artist, venue or cancellation and refunds related to the tickets for SRIDEVI TRIBUTE LIVE CONCERT. 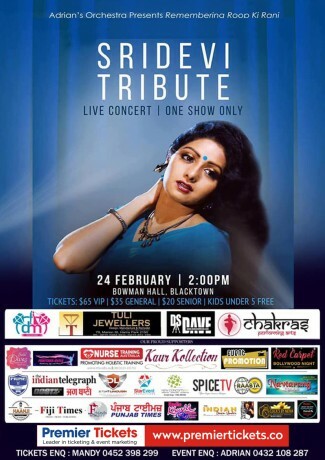 Premier Tickets Australia is proud to be the online ticketing partner for SRIDEVI TRIBUTE LIVE CONCERT @ Bowman Hall, 35 Campbell Street Blacktown, NSW 2148 Australia.